Ricardo Oarin. Gaston Pauls. Leticia Bredice. Tomas Fonzi. Thriller. Drama. 01 Will's stamp of approval. 01 Nigel's Choice. Dave T's Platinum Picks. 01 Adam's Faves. Recommended. Sarah's Specials. Everything takes place over the course of just 24 hours in the hive of hustle and bustle that is Buenos Aires. A young con artist is spotted and recruited by a master of the game and together they set in motion a crime of fantastical audacity; But for two men who've made their living from the art of deception the temptation for a double cross is almost too much to bear. 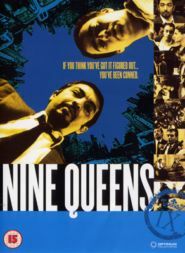 Nine Queens is an incredibly sharp thriller that just gives you enough time to grasp what's happening before making another wild side-step that leaves your confident predictions of what's going on and whose responsible utterly redundant. Taught, clever, tense and witty this is a class piece of cinema.